Super Bowl LIII Preview: A Rematch, Young vs. Old, Two Lucky Teams and Gambling! This year's Super Bowl will be 17 years to the day since the Patriots at Rams first met in the Super Bowl - the first Brady/Belichick championship, when the Patriots put themselves on the map with what was, and still is, the biggest upset in the history of the Super Bowl. This game can't quite be considered a rematch, given that the only holdovers from that game are Brady, Belichick, and New England offensive line coach Dante Scarnecchia. That's not exactly surprising, considering back in 2002, the No. 1 movie in the US Box Office was a movie starring a man that hasn't been the governor of California for eight years. It's been a while. Furthermore, one of the teams has moved cities after spending the overwhelming majority of the last decade and a half as one of the cellar dwellers of its conference, while the other team went from the plucky underdog that happened to almost accidentally win a Super Bowl, to a team that everyone south and west of 42N73W openly despises. Like I said, it's been a while. All that being said, it is the Rams against the Patriots, and you're going to see about 76 hours of coverage about the fact that these two franchises played against each other 17 years ago. At the very least, this game could serve as a bookend to the start of this Patriots' dynasty. Yes, Tom Brady said in an interview that there's zero chance that this will be his last game, but can't you imagine a scenario where the Patriots win this game 40-17 and Tom Brady rides off into the sunset? At the very least, it's possible. 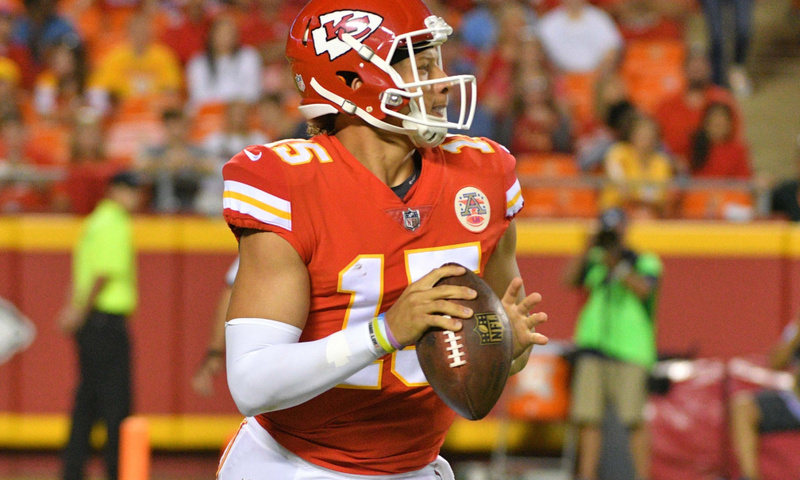 Patrick Mahomes has enjoyed a magical first year starting for Kansas City, but come on. He isn't gonna beat Tom Freakin' Brady in the AFC Championship Game, is he?... Is he? Well, last weekend went according to script. All four home teams won. Three of them covered. Two of them covered comfortably. Joe went 4-0 straight up, 3-1 against the spread (picking the Colts to cover against Kansas City). Jeremy went 3-1 straight up (missing that same KC-Indy game), 2-2 against the spread (also missing on New Orleans), bringing our records for this postseason to 5-3 (5-3) for Jeremy and 5-3 (7-1) for Joe. These four teams advancing to this round seems appropriate. It really seems like these four teams were just better than everyone else this year, kind of like that year where all four No. 1 seeds advanced to the Final Four of the NCAA Tournament (the Derrick Rose on Memphis, Tyler Hansbrough on North Carolina, Kevin Love on UCLA, Mario Chalmers & Co. on Kansas year). I suppose you can make an argument that Chicago and the Chargers were in that conversation as well, but based on how those teams played in the playoffs, probably not. Both of the games this weekend are rematches. In the AFC, this week's road team won the first matchup, but they won it at home. In the NFC, this week's home team won the first tilt, and they're at home here again (in large part because of that win). Both games represent the old vs. the new(ish). 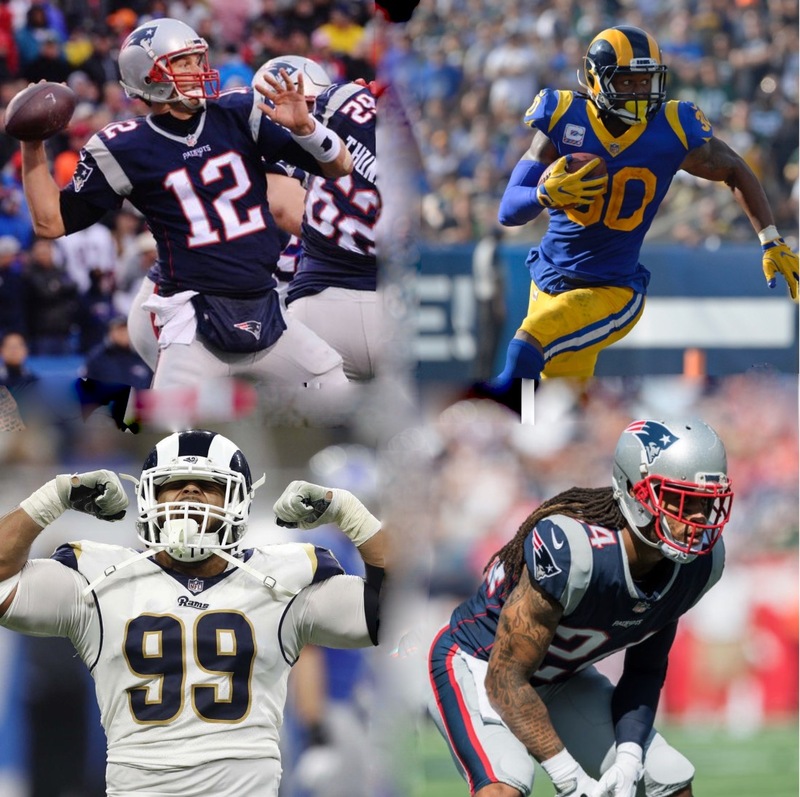 The Saints and Patriots represent The Old Guard of their respective conferences - coaches that have been with the organization for over a decade; former Super Bowl champions; future Hall of Fame quarterbacks that attended college in a different century. The Chiefs and Rams are the new. Young, vibrant quarterbacks with upside to potentially match or exceed the ability of their older counterparts; teams that haven't reached the Super Bowl in decades; teams itching to make a name for themselves. 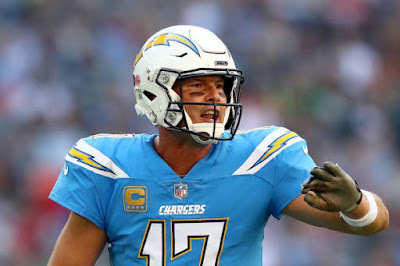 Is this the year Philip Rivers and the Chargers finally break through to the Super Bowl? And, so, like, are all the people in San Diego rooting for them? In the divisional weekend, we saw a surprise three road teams win, and almost saw a road sweep. In fact, all four road teams covered the spread (the Cowboys closed favored by two and a half). Four especially close games benefited those of us who bet on underdogs, which was both of us. Joe went just 1-3 straight up (correctly picking Indianapolis), but somehow ended up 4-0 against the spread. Jeremy was 2-2 straight up (hitting both AFC games, missing both NFC games), and went 3-1 against the spread (only Chicago let him down). This season really saw the cream rise to the top, however, so we're probably in store for a few more lopsided games this weekend. Last week's biggest line was Chicago favored by six; both NFC games opened with higher lines, and both AFC lines are larger than any of the other lines from last weekend. As with last weekend, we'll dive into the numbers for each team, focus on a few key players and statistical trends, and picking each game by score, which will also serve as our picks against the spread. Let's get to it. 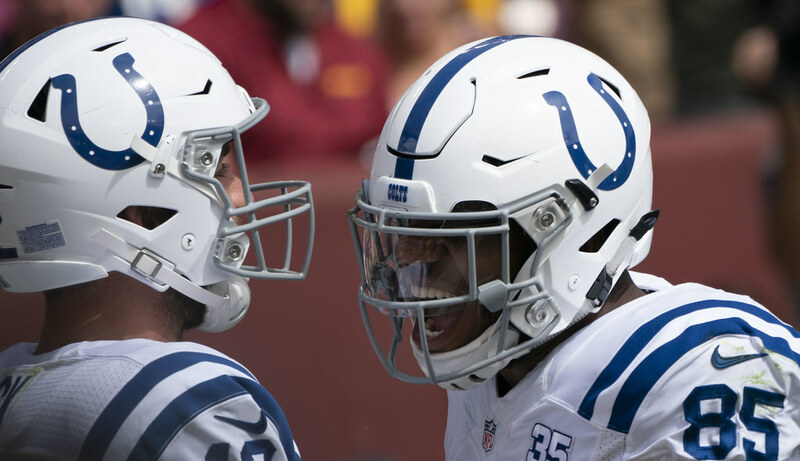 Andrew Luck and Eric Ebron are primed to potentially pull an upset in the first game of the weekend. So, we dropped the ball a little bit. With all of the hectic traveling and revelry around the holidays, we forgot to actually write down our picks the last two weeks and publish them in this space. In lieu of that, we just texted each other our picks and used the honor system. Joe held a six-game lead entering Week 17 and the way our picks lined up, we didn't disagree on six games. So Joe technically clinched the season win in Week 16. This is his fifth win in six years. It was the worst showing in the six years of picking head to head for both players. Jeremy finished 115-132-9, and Joe finished 121-126-9. Cumulatively, for the six-year history, Joe holds a 20-game lead (760-722-56 to 740-742-56). Historically, however, Jeremy has taken home the postseason crown, winning all six years picking against the spread (Joe has won two years picking playoff games heads up). So we'll see if Joe can finally take down the postseason title. We're going a bit more in-depth for the playoff games, as we always do. In the "By the Numbers" section preceding each game, we'll list each teams DVOA ratings for the season. DVOA is a stat developed by Football Outsiders designed to measure each team on a per-play basis, adjusting for down, distance, time, and score. For example, gaining six yards on 3rd-and-5 is more valuable than gaining 11 yards on 3rd-and-12. Furthermore, it's easier to convert a 3rd-and-5 from your own 20 yard line when you're down by 28 points early in the fourth quarter than it is to convert that same 3rd-and-5 at the opponent's 10 yard line when you're down by four points with a minute remaining. DVOA adjusts for all of these things to some extent. DVOA is represented as a percentage better or worse than average, so good offenses will have positive scores and good defenses will have negative scores. After the craziest play of the season, the Dolphins are looking to prove they can string some wins together, while the Patriots are looking to bounce back against a desperate Pittsburgh team. Jeremy's Patriots and Joe's Steelers square off this week, and while we've made plans to meet up and watch the game, we're not exactly feeling that great about our respective hometown teams after this past weekend. Both teams need the win. The Patriots need a win to be a single game behind Kansas City and the Chargers, putting them in a position to potentially steal the No. 1 overall seed in the AFC on tiebreakers. That seems especially important for them this year, considering they're 6-0 at home and 3-4 on the road, with those losses coming against the Lions, Jaguars, Titans, and Dolphins. The Steelers need a win to simply stop the bleeding - they've lost three straight and suddenly hold only a half-game lead over the Ravens in the AFC North, and a half-game lead over teams like the Colts, Titans, and Dolphins for what would end up being the No. 6 seed in the AFC playoff bracket. That all doesn't even include the Broncos and Browns, who are still somehow very much alive. Jeremy picked up some ground last week, going 9-7 overall and 4-2 on disagreements (and is like, actually kinda mad about not pulling the trigger on Miami and San Francisco and Indianapolis like he wanted to). Joe dipped back below .500 on the year, but still holds a six game lead. He also took the Thursday game this week - Jeremy didn't have faith in the Chargers with the injuries that they're piling up, but they were able to pull it out anyway.